EK-HD Tube D.I.Y. Kit 10&12mm is a Do-It-Yourself modification kit for solid acrylic tubing with Ø10- and Ø12mm in inner diameter (ID). Using heat gun and the enclosed silicone cord (rod) it is possible to make customized pieces of solid tubing. Use hacksaw to cut pieces to lenght and sandpaper to chamfer and smooth out the edges. 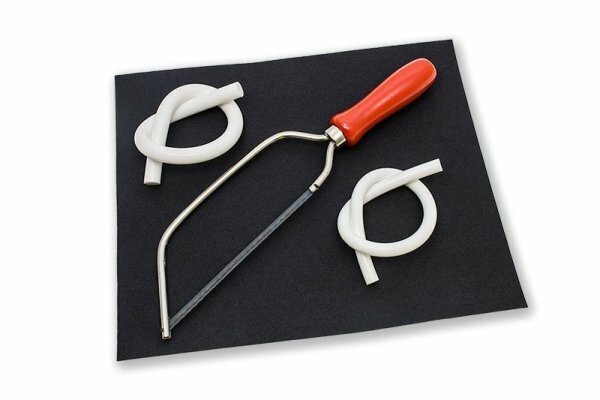 Enclosed: – 1x hacksaw – 1x sandpaper (P220 grit, 230 mm x 280 mm) – 1x silicone cord Ø9.4mm (L=33cm) – 1x silicone cord Ø11.7mm (L=33cm) For expert users only!